Chronic sinus infections are inflammations of the sinus lining lasting three months or more. They are most commonly caused by bacterial, viral, and/or microbial infections. Structural issues such as blockage of the sinus opening can also lead to chronic sinus infections. If the opening is closed, normal mucus drainage may not occur. This condition may lead to infection and inflammation of the sinuses. Sinus infections are typically treated with medication prescribed by your doctor. However, for some patients medication will not provide symptom relief, and surgery will be recommended. 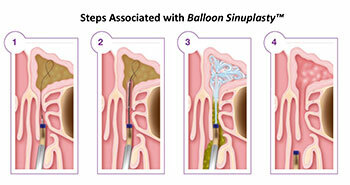 Balloon Sinuplasty™ Technology is a safe and minimally invasive system that widens the maxillary sinuses in children. It is used as a tool by surgeons in the treatment of chronic sinus infections. Unlike traditional sinus surgery, it does not require bone or tissue removal. Preliminary results from recent studies indicate that opening a sinus using Balloon Sinuplasty™ Technology in children has an excellent safety profile and may be an effective treatment option for blocked maxillary sinuses. 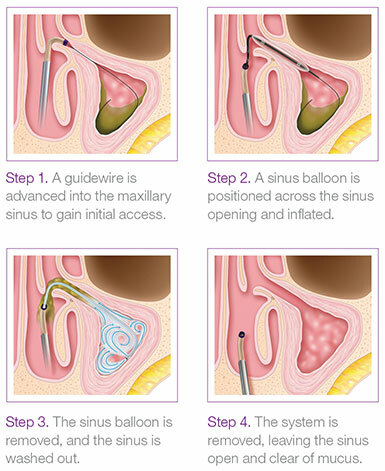 The Balloon Sinuplasty™ System uses a small, flexible balloon catheter to gently open the blocked maxillary sinus.